I thought the frog turned into a prince, not a princess? This is really beautiful and serene! I feel calm when looking at this photograph. Beautiful composition . 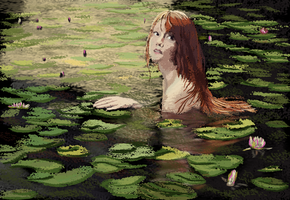 . . Love the red hair against the lily pads. Amazing photo, I absolutely love the lighting on this. But man, that must have been cold! This is just so beautifully exquisite, absolute perfection. I am genuinely lost for words. ow, thank you so much! I'm not afraid of the waterlilies anymore. Lady of the Lake... I wanted to criticize something a bit, just pro forma But can't find any serious fault. Really nice composition, colour, face expression and gesture. Well done, indeed. Will return from time to time. A very charming and beautiful image, serene and enchanting. I love her facial expression, especially her eyes, and her hair trailing in the water. The lilies are a nice final touch. Oh ? A fav' ! Very nice photo, nice subject. Was it rainy, at this moment ?